Probably no mobile iOS gma on steam though. 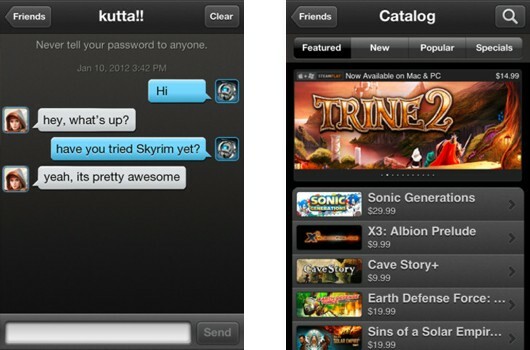 Valve today announced and launched Steam applications for both iOS and Android platforms. The app, dubbed "Steam Mobile," allows users to chat, read a limited selection of syndicated gaming news (might we also suggest another mobile app for that? ), browse groups and profiles, and purchase games while on the go. Like many Valve products before it, the App is launching in limited beta, with only invitees currently able to log in. Snagging the App and attempting to sign in lets Valve know that you're interested, and select folks will then receive an invite should they be chosen. Company president and co-founder Gabe Newell said the app comes at the request of many fans over the years -- it marks Valve's first foray into the mobile space. "Mobile is changing the way people interact, play games and consume media, and the Steam app is part of our commitment to meet customer demands and expand the service functionality of Steam to make it richer and more accessible for everyone," Newell said. No news is given regarding the potential for iOS or Android game selling through the Steam mobile portal, but it seems unlikely -- at least on Apple devices -- given various terms of service restrictions regarding competition with the official application stores. Both the Android and iOS versions are available as of right now.